Plants need the proper nutrients to reach their natural growth potential, and the goal of modern fertilization practices is to provide it. But there's more to it than that. It's just as important to limit the amount of fertilizers to the correct level for maximum growth, avoiding costly excessive application. And there's an environmental cost to incorrect application, too. Excess nutrients may seep into creeks and rivers and alter ecosystems. Yara's Precision Farming concept allows farmers to increase the efficiency and accuracy of fertilizer inputs to maximize profitability and minimize impact on the environment. Nutrient requirements of the crop fluctuate greatly between fields, but also vary widely within a field. Engineers at Yara developed the N-Sensor for the site specific management of nitrogen application. N-Sensor is mounted on the tractor roof and is 'on the move' measuring light reflectance from the crop, translating this into an optimum application rate enabling the application equipment to apply the required rate for that specific part of the field. The N-Sensor determines a crop's nitrogen demand by measuring the crop's light reflectance. Using this information N-Sensor can measure the crop, translate the data into an application rate and send a signal to the spreader or sprayer rate controller, which will adjust the levels of application. The average application rate is always determined by the operator before spreading begins. Variably applying nitrogen according to the crop requirements means that the optimum rate of nitrogen is achieved for all areas of the field resulting in increased gross margin. Allows for crop information to be collected, processed and applications made on the go. Applying the optimum rate to all areas of the field improves yield and also significantly evens up the grain, factors which both increase profitability. Applying the exact crop nitrogen requirements improves efficiency and economics and also minimizes the effect on the environment. Can be used independently or in conjunction with DGPS - By measuring the crop and applying the recommended application in one operation, the N Sensor works independently of GPS systems. However, where nitrogen application maps are required it can easily be linked to a DGPS system. N Sensor has been designed to be user friendly. 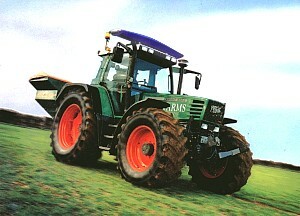 The in cab computer is clear and simple to operate and once set up works automatically while spreading or spraying. Improved harvest conditions Even crops can result in quicker and simpler harvest conditions. Flow of crop into the combine is improved and more uniform grain moisture means less drying will be required. If you need more info about the N-Sensor, please contact Yara.